It must be apparent to you all, having read the series over the past months, Just how difficult the day to day existence of the British soldier must have been and especially during the first decade immediately following their arriving in 1708. 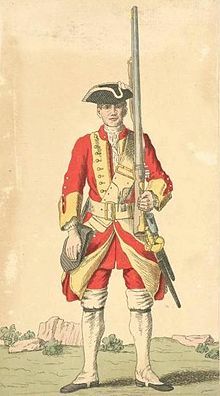 Mostly the soldiers were from various Regiment of Foot (today ´s infantry) and raised by county gentry. They were originally given numbers corresponding to the oldest to the newest. Regimental names by county were not adopted until the end of the 18th. Century. 8 gills (2 pints) of beer or rum. A soldier in camp could also expect to be provided with a loaf of bread expected to last about four days. A normal private soldier would normally have been paid 8d per day (about 2.5 new pence) if serving with a Regiment of Foot but to purchase a loaf of bread would set him back around 2 new pence. BUT THESE WERE NOT NORMAL TIMES !! Here in Minorca it was the exception not the rule. Firstly the local Minorcan people relied on subsistence farming and were used to growing crops of poor nutriconal value such as pumpkins, melons etc. Meat, milk and eggs were scarce. Secondly the British Exchequer was sorely depleted because of various battles such as in Canada, Ireland and the Low Countries. Troop supplies were irregular and the troops were not being paid on a regular basis. We know that Governor Richard Kane was constantly pleading with the Government for money and supplies. Normally the soldiers could pay for billeting with local families and purchase fresh vegetables to supplement their diet. However in the beginning this was not possible for lack of money. Richard Kane was strictly maintaining the orders of Queen Anne to win the “hearts and minds” of the population and once he heard of stealing by the soldiers he introduced severe punishments for any soldier found so doing. He re mortgaged his home and property in London to enable him to pay the troops and encouraged the senior officers of the regiments to do likewise. This helped the local economy and gradually things started to improve for everyone especially once the camp followers and the soldiers wives and children started to arrive. No doubt the first few years were hard but this did not stop the soldiers from celebrating at any opportunity and, of course, Christmas was no exception. Once regiments adopted mass catering and with many of the soldiers establishing family homes it was possible to save ingredients for special meals. In Minorca could be found many plants growing wild still existing today. Wild garlic, onions, asparagus, herbs and fruits and berries and to augment and interest to the food it was possible to forage for these. Also the newly established vegetable gardens were of enormous value. The main meal of the day would invariably be a bowl of salt beef made into a stew with potatoes and occasionally with a second course which would be stale bread softened with watered down milk and added sugar cooked in the oven. But for Christmas----- To the beef stew would have been added, as well as potatoes, possibly chunks of turnip together with various herbs and wild garlic and onions foraged from the surrounding contryside. Cabbage or kale would be the accompanying vegetable. Although it would have been very unusual to be able to get hold of a chicken it would possible should there be sufficient money to purchase fresh fish from a friendly fisherman for this special occasion. This would have made a treat grilled as a starter course. Afters would be “PUDIN” a legacy left by the British and very popular in Menorca today. 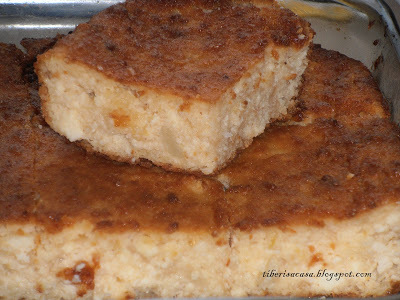 Pudin would be the typical bread pudding, but for this special occasion would be prepared with milk and include various dried fruits such as raisins, sultanas, apricots sweetened with sugar or if lucky with honey. It would be very unusual to be able to add eggs or butter as these were scarce but a touch of cinnamons grated over the top would make this a special treat for Christmas..